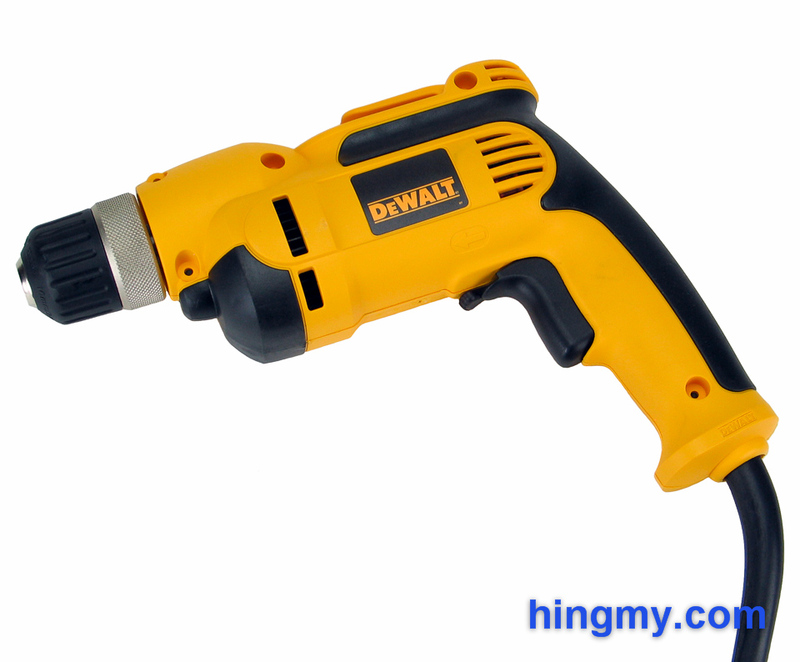 I have been using an earlier version of theDeWalt DWD110K as my primary drill for almost a decade now. It isone of those tools that outperforms its own price tag by a widemargin. I never felt a need to upgrade. For this reason more thanany other I recommend the DWD110K as the drill a first time homeowner should buy. Let's take a closer look at what makes theDWD110K such a good combination of performance and price. Drills use a fast spinning drill bit at low torque to shave holes into wood, plastic, or metal. They are best used for making holes, and peform poorly as drivers. The chuck type greatly affects a drill's utility. A friction chuck is best for users that change bits often. A keyed chuck grips bits more securely, but it takes longer to change bits. SDS and other specialty chucks improve both bit change speed and holding power at the cost of having to purchase much more expensive bits. To drill holes in stone, concrete, and tile the drill needs to be equipped with a hammer mode. This mode adds thousands of lower power blows inline with the drillbit to the drilling action. The dril bit now acts like a chisel and breaks up any material it cannot wear away with the drilling action. Without a hammer mode drilling holes into concrete is almost impossible. Drills are notoriously bad screw drivers. The low, continuous torque a drill produces is at odds with the high, burst-like torque that works best for driving fasteners. If you try to drive a screw with a drill, the drill will twist out of hand as soon as the screw starts to bind, or fail to sink the screw into the material. Use an impact driver for driving screws. Some impact drivers are sold as drill/drivers. These tool strike a balance between torque and speed that allows the tool to perform well as both a driver and a drill. A drill/driver, however, cannot reach the performance offered by a dedicated drill or driver. Drills function best for drilling holes in woods. Use an impact driver or power screwdriver for driving screws. Use a hammer drill for drilling into concrete and stone. A drill lacks the impact mode required to break stone. The pistol grip is the default choice for a drill. These model are the easiest to control and are the most versatile. If you plan on drilling holes in tight spaces, consider purchasing a right angle drill. These tools are specialty tools. Most carpenters use one in addition to a small pistol grip tool for generic drilling. The other types of grips are found on specialty drills. Choose a spade grip, if you plan on mixing paint or conrete with the drill. A D-handle is found on heavy duty drills. The motor size of a drill is the main factor in determining its drilling power. Larger motors drill holes faster, and have higher duty cycles. If you plan on drilling a lot of holes in a short time, consider a medium size model. If you drill only a few holes at a time, a entry level drill will produce the same results at marginally slower speeds. Choosing a motor size also determines the size of the tool. Larger drills have larger motors. Keeo in mind that although a larger drill can drill small holes, it will be cumbersome and slower to use. Just about any power level is enough to drill a hole in wood. It's just a question of how long it will take for the drill to complete the task. If you are only drilling a few holes at a time, just about any drill will be good enough. The choice of chuck determines the tool's most common use case. A friction chuck is the smallest chuck of all. The chuck is fastened by hand. Its holding power is limited by the user's arm strenght. It does, however, provide more than enough holding power for bits smaller than 1/4". Combined with its fast bit change times makes the friction chuck the default choice for an everyday drill. A keyed chuck uses a key to secure the the bit. The added leverage provided by the key allows the chuck to hold the bit more securely. A keyed chuck is a good choice for bits between 1/4" to 1/2". Bit change times will be much slower than those of a friction chuck. Bits larger than 1/2" are rarely found on drills. A specialty chuck is a good choice for these drill bits. The bits become more expensive, but the added holding power of the specialty chuck and quick tool changes are a worth while tradeoff. "About as powerful as you need a non-hammer drill to be. This tool will work hard for you all day long. Somewhat heavy, but will last in a shop or on the job." "Great small bit performance for an unmatched price. The best first-drill for a home owner. Professional endurance. Low torque at low speed, not for large holes."